It is not a question of what Bacolod is today but what Bacolod could become in the future. For what Bacolod is today is not the work of one but of each one of us. The future we all dream is not going to be the work of one, but a concerted effort of ALL of us. We cannot allow our City to be left behind. It is now apparent that project and program results are demanded from various local government units, more especially from those highly urbanized, when they implement specific and measurable activities and outputs using public funds. But in our city, our leaders simply use public funds to hire thousands of temporary workers, as election time nears, to serve as armies to ensure their stay in power. Social services are delivered down to the last Barangay. Adoption of strategic goals and timelines for job generation, solid waste management, peace and order, traffic management, tourism development and many more. Every Bacolodnon should measure the performance of the incumbent on the basis of these indicators and more. Each Bacolodnon should get a sense of how the incumbent has performed based on these measures. It is for the voting public to give the incumbent a score based on his performance along these parameters during the years of his incumbency. It not for the incumbent to assess himself nor for the hordes of temporary workers paid by public funds to become campaigners. Some of whom are now even crying silently because they are pushed into oppression to vote for all the candidates of my opponent even when they wanted to exercise their choice. Sadly, many lament about how traditional politics crippled our city for a long time and to this day. Politics anchored on slogans, patronage, hypes, personality, may not be entirely bad. However, we deprive ourselves of real and genuine leadership. A leadership anchored on a vision. When I joined politics for the first time in 2001, the question I asked were: Am I competent? Am I capable of becoming a councilor? Can I deliver and fulfill my promises to author milestone legislations for women, for children, to create jobs, to impact the lives of people? 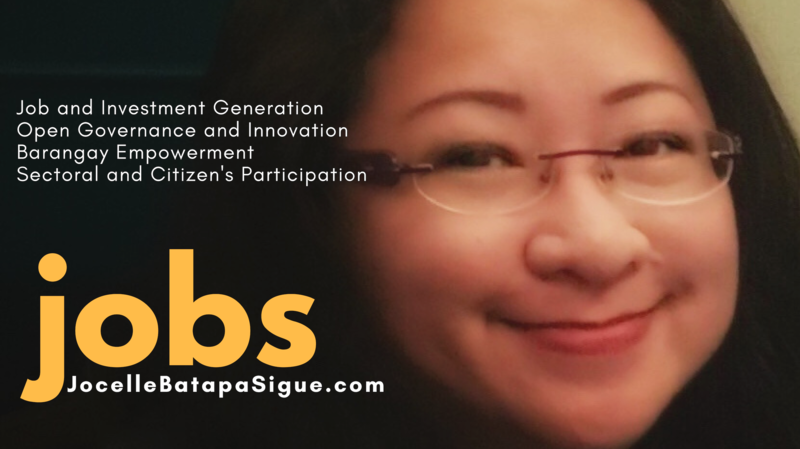 I spent my years in the City Council writing, crafting ordinances under my assigned committees: Women and Gender as well as Information and Communications Technology. Sadly, I have never chaired any other significant committee until my last year when I was allowed to handle the tourism and trade committees. But I never gave up my dream of making a difference. I created a difference anchored on programs for women and gender and ICT. I established working relationships and networked with many organizations. Over the last decade and through these networks, I represented Bacolod in national and international fora – lifting the banner of Bacolod to the world as an Eisenhower fellow of the Philippines, in the Asian Society as a Ten Outstanding Young Leader, as a Philippine ICT Individual Contributor of the year, as one of The Outstanding Women in Nation Service (TOWNS) and many other organizations and accolades received. I was a neophyte in 2001, doubting my capacity and value in an elective post for the first time. But after 18 years, I dare say, I am ready. I am competent. I am capable to be MAYOR of BACOLOD. Light industrial economic zones at the relocation site and old airport area. So starting today, I will be your voice. This I intend to do if you allow me to serve you for three years as your Mayor. Bacolod City, I am here for you.